OctoPass Server is a CGI application running under on HTTP server. Please note that requests are always sent from agents to server; server never sends requests to agents. The network settings must provide that agents' HTTP requests are not blocked and able to reach server. To add a new computer to an OctoPASS network, simply install OctoPASS Agent on that computer; no other settings or configurations are necessary . OctoPASS Agent can be installed in the completely automatic silent mode; simply run a single application that doesn't require any configurations. This lightens the deployment of OctoPASS on a large number of computers. Complete the installation of OctoPASS Server on the server computer that will coordinate the performance of all other computers. The selected server must be available to all workstations. The interaction between the workstations (OctoPASS Agents) and the server is carried out through the HTTP (TCP port 80, but you can change the port number) protocol; please configure your firewall and network settings as necessary to ensure the interaction is not hindered. OctoPASS Server must be to all computers running OctoPASS Agent. After OctoPASS has been installed, install OctoPASS Agent on all computers connected to the network. for example, http://localhost/cgi-bin/OctoPASS.exe If your browser offers to download the octopass.exe instead of opening the web page, it means that CGI is not properly configured on your server. You should allow running CGI programs for the directory where OctoPASS server is installed. Brief information about the software: version number, license information, short introductory information. Status of the current password recovery task. If the password is found it is displayed here. Recent Records: latest records from OctoPASS log file. Command Menu. Using these commands, you can control OctoPASS Server and the recovery process. Once the installation of OctoPASS is complete, the server runs in the Idle State and expects to receive a task . You can submit it the test task, designed specifically to quick check the functioning of OctoPASS, using the Command menu. To make use of OctoPASS in solving the real tasks , you will need the corresponding Password Recovery Software available on our website at www.LastBit.com. Run the password recovery application (for example, Word Password). Select the password-protected document that you want to recover. Choose the Custom (user-defined) password recovery mode. Choose "Brute Force Attack" (OctoPASS is designed for brute-force attacks only). Set up brute force attack options, such as the password length and character set. 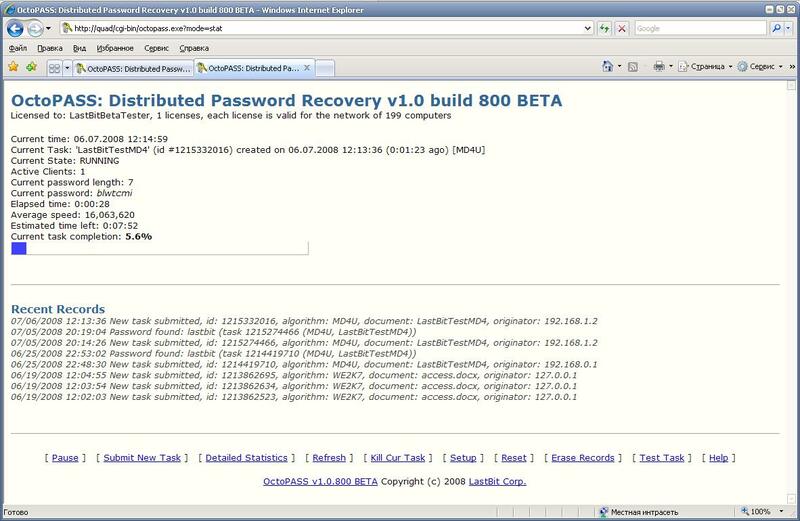 At the last step, choose "Submit the recovery task to the Distributed Password Recovery Engine (OctoPASS Server)". Enter the URL of the OctoPASS server; for example, http://computername/cgi-bin/octopass.exe . If OctoPASS is installed in the /cgi-bin directory, you can just enter the computer name; for example, MyPC . If you have installed OctoPASS Server to be protected with a password, you will have to enter the correct password in order to submit a password recovery task. Click 'Next' and then click 'Finish'. The task will be submitted automatically to OctoPASS Server. You can also submit the task manually. To do that, tick off the 'Show detailed submit information' checkbox. On the information screen that appears, copy the request string. Now you can use the 'Submit New Task' command on the main OctoPASS Server screen to submit the task. Normally, you should submit password recovery tasks automatically. Now open OctoPASS Server in your Web Browser, so you can monitor and manage the recovery process. All these commands appear on the Command Menu of the main screen (open OctoPASS Server in your Web Browser in order to see it). Immediately refresh the main screen (the main screen is updated automatically every 30 seconds). Normally, password recovery requests are submitted automatically. However you may submit a password recovery task manually. Cancel the current task. This operation cannot be undone. Once the task has been killed, OctoPASS goes to the idle state. After a task has been killed, the agents will continue running for a while, but after contacting the server they will also go idle. Pause the recovery process. OctoPASS Agents will go idle. You can resume the recovery process later. Like in the case with cancelling current task, the agents may continue running for a while before they go idle. Shows detailed statistics. Here you can see the list of agents and other information. Resets OctoPASS Server. All active tasks will be canceled, and the default settings will be restored. Takes a "snapshot" of the current OctoPASS state and saves it to a specified file. You can restore the state later. Here is a possible application of this command. You "pause" one task in order to run a new, more urgent task and then get back to the previous task. Restores the state. The running recovery task will be cancelled. Submits a test task. The test task is a brute-force attack on an MD4 (ASCII) hash. The hash is CA2FB1F26ED29FDC8D05BFEA45C351F8 and the program is to find the original string using the brute-force attack (alphanumerical character set, password length: 1..7). The original string is "lastbit". The tesk task is designed for the testing purposes only. You can use it to verify whether OctoPASS is installed and works properly. The task takes about an hour of working time on a single computer (depends on the CPU type and speed). If you have a GPU engine installed, the task should take just a few minutes. OctoPASS Agent has been developed to minimize the interaction between the software and user (in the majority of cases, such interactions is not necessary at all; OctoPASS Agent simply utilizes the computer's resources). OctoPASS Agent displays its icon in the tray area; however, during the installation, you can choose to disable displaying the icon. If the icon doesn't show, use the Ctrl-Shift-Alt-O shortcut to open the main window of the application. Also, during the installation you can specify whether or not OctoPASS Agent is to run automatically when Windows starts. Keep in mind that if OctoPASS Agent is not running on some computer, that computer will not participate in the password recovery, and, accordingly, the search speed will decrease. Therefore, our recommendation is to enable the automatic starting of OctoPASS Agent. Right-clicking on the tray icon will show the menu. You can pause the recovery (on this computer only; other computers in the OctoPASS network will continue running). You can adjust the process priority. When the idle priority is selected, OctoPASS Agent works only when the computer is idle. This decreases the search speed, but other programs running on the computer work smoother. User can use the computer for other tasks. If the higher priority is selected, OctoPASS aggressively consumes the computer resources - it works faster; however, other programs may run slower. Q: How do I change the port number? Make sure that the HTTP server is configured properly and serves the desired port. When submitting recovery tasks, specify the OctoPASS Server along with the port number. A: Run OctoPassAgentSetup.exe with the /s command-line switch to install OctoPASS Agent silently. No questions or confirmations will be shown.